Sure, itchy ears are annoying. But resist the temptation to stick something in there to scratch the itch. Discover what may be causing your itch and how to avoid making it worse. When it comes to itchy ears, you may be your own worst enemy. So put down that cotton swab (or whatever you were about to stick in there) and think about that for a minute. Now let’s talk about what you should — and shouldn’t — do for your ears. Itchy ears are quite common and aren’t usually a sign of a serious condition. But sometimes the things you do, or forget to do, can cause them to itch — or make the problem worse. Ear surgeon Erika Woodson, MD, says itchy ears are a universal experience. “It’s part of the human condition, but it’s not generally something to be concerned about,” she says. Dr. Woodson says nearly half the patients she treats have ear conditions they caused themselves. The biggest culprit? Excessive or intrusive cleaning. Over-cleaning can remove that protection. While it may provide temporary relief, it leaves you open to bigger problems than that tickle in your ear. Sticking objects in your ear canal to clean it (or to scratch an itch) often just makes matters worse. You’ll likely just push the wax farther in. And that can lead to earwax buildup. Itchiness is often a symptom of wax buildup, but you’ll likely notice other signs — pain or an odor coming from the ear, for instance. “Most of us don’t need to clean our ears at all,” says Dr. Woodson. Earwax generally comes out of the ear canal on its own. And you can wash it away from your outer ear when you bathe. 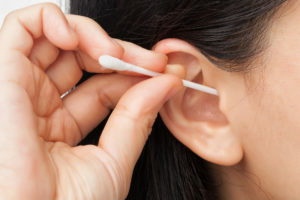 What to do: You can typically treat earwax buildup at home. Use ear drops to break up the wax, but don’t try to clean out the ear canal with anything else, Dr. Woodson advises. See your doctor if drops aren’t effective. Dermatologic conditions like eczema and psoriasis can surface on various areas of the skin — and make you itch. But the rashes or plaques can also develop in places the eye can’t see. “Your ear canal is lined with skin, so eczema and psoriasis may also show up there,” Dr. Woodson explains. What to do: If your ears itch and you have a condition like eczema or psoriasis, see your dermatologist, or an ear, nose and throat specialist. “Get your ears checked out — your itch may be caused by a treatable dermatologic condition,” says Dr. Woodson. Itchiness is one early symptom of an ear infection. But you’ll typically see other symptoms as well. “If you feel pain in the ear or there’s discharge from the ear, it’s time to call your doctor,” Dr. Woodson says. These are signs of an infection, which can harm your ears or damage your hearing. Dr. Woodson notes that those who use hearing aids are sometimes more prone to fungal ear infections. What to do: Don’t hesitate to call your doctor about an ear infection. And if you wear a hearing aid, clean it regularly to avoid itchiness and infection, following the manufacturer’s directions. Mild ear itchiness is usually temporary and goes away on its own. If your itch lasts more than a few days, or if you have other symptoms, see the doctor. And remember, cleaning your ears the right way will help you avoid problems.